In our last blog post, “Gauging the Value of Gages,” we discussed the importance of stream gages to The Miami Conservancy District’s (MCD) flood protection activities. Now let’s talk about the importance of stream gage information on riverfront development, infrastructure projects, public safety, and water quality. Stream gages provide reliable estimates of peak river flows that must be incorporated into engineering designs for infrastructure in floodplains and river channels. The infrastructure includes everything from levees, bridges, bikeways, boat ramps and docks, riverfront parks, kayak runs, and water and wastewater treatment plants. Imagine the implications of building riverfront projects and bridges without knowing how high the river will rise. Stream gage information allows recreational paddlers and boating clubs to determine whether or not it’s safe to go out on the river. It is also used to determine when river corridor bikeways are dry and safe or whether portions are under water. FEMA uses river studies to develop more accurate FEMA floodplain maps. 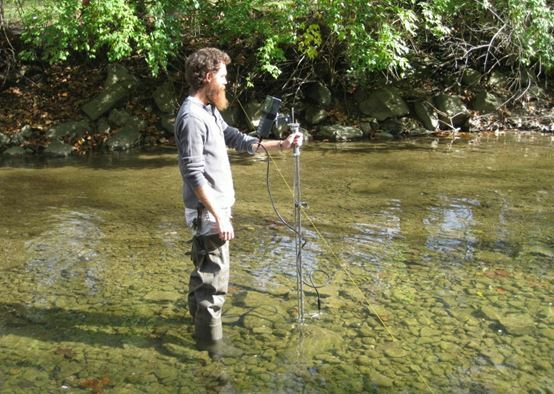 Those river studies rely on data from stream gages. Wastewater treatment plant permits regarding discharging pollutants into waterways are often based on certain river flows. Stream gages can be used to determine these river flows. A stream gage measures the elevation of the water surface at a particular point in the river channel (not the entire river channel). We call the elevation of the water surface the stream or river stage. Stream gages do not directly measure flow. To measure flow, MCD staff goes into the river with instruments that measure discharge – usually measured as cubic feet per second. An MCD staff member takes a discharge measurement on Holes Creek near Kettering. If we measure the discharge in the river channel over a wide range of river stages, we can develop a mathematical relationship between stream stage and discharge that estimates the amount of discharge for any given stage. This relationship is called a rating curve. Once the rating curve is developed for a stream gage, we can determine reliable estimates of river flows. This is important because it is not cost-effective, practical, or safe to send staff into the river every time that information is needed. Steam gages measure stage on a real-time basis, so with the rating curve, stream flow can be estimated on a real-time basis. Historic records of actual stream flow conditions allow us to predict future conditions, including peak flows. The stream gage network in the Great Miami River Watershed consists of 25 stream gages. These gages are also part of the United States Geological Survey (USGS) national stream gaging network. MCD purchases most of the equipment and provides most of the field labor to maintain the gages. USGS manages the data, providing the ability to transmit data through GOES satellites, and allowing users to access the data through the National Water Information System (NWIS). This stream gage network is funded by a combination of federal and local funding sources. Federal funds are provided by USGS and the U.S. Army Corps of Engineers. Local funding is provided by MCD. Everyone needs stream gaging information to support good engineering design and flood forecasting. A reliable stream gage network is integral for regional efforts to improve flood preparedness, develop new riverfront corridors in our cities, improve water quality, and support recreation on our rivers and streams. Without the network, we would be flying blind. Most people think information that comes from stream gages is just a matter of installing a sensor somewhere and letting it do its thing. Unfortunately, it’s not that simple. It takes time – lots of time, if you do it right. And that costs money, from equipment to staff time. Each year, funding for the national stream gage network is threatened with cuts to the federal budget. Please let your local congressman know it’s important to protect and support our system of stream gages and data transmission satellites so it continues to provide our region with valuable water information.